If you're looking for a romantic honeymoon getaway where "kid free" is the order of the day, then these couple friendly resorts are for you. They cater for honeymoon couples, couples celebrating anniversaries or renewing their marriage vows. Maybe you're just lucky enough to have the kids looked after while you have a romantic getaway to reinvigorate your relationship with your significant other! No matter what your excuse, these Fiji honeymoon and package resorts are perfect for a romantic break. Try our Fiji Weddings page for more info. *Please Note: Some properties exclusive to adults may allow children 12yrs and over. Please check with individual web site for further details. Tokoriki is a 5 Star Resort that is luxurious yet still relaxed and friendly. It offers spacious bure or villa style accommodation that ensure privacy for couples. Its renowned as one of the most exclusive resorts catering for couples and Fiji honeymoons. Children under 12 are not accepted at this resort. 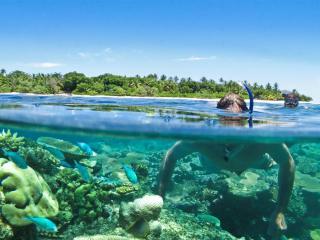 The Warwick Fiji located on the Fiji's beautiful Coral Coast, is nestled in 28 acres of tropical gardens. The Warwick Fiji offers guest exception value for a luxurious honeymoon experience. The Warwick Fiji offers superior resort facilities, great range of activities and luxurious health spa for those who wish to relax and unwind. Matamanoa Island Resort is an intimate boutiques style resort that caters for adults only. The Resort has created a very relaxed atmosphere where people can relax in peace and rejuvenate. Children under 12 are not accepted. Vomo Island does cater for families, but is known for its luxury accommodation and first class service. Vomo Island caters for hundreds of honeymoon couples every year and has a reputation as being one of the finest Resorts in the Fijian Islands. Likuliku is truly an adults only resort, with children under 17 years of age not accepted. Likuliku is a very luxurious and romantic Resort and it is perfect for celebrating a special occasion. Honeymoons, Anniversaries or birthdays. Whatever the occasion this is truly a special destination and Resort. Spoil yourself and your loved one at this intimate and most luxurious 5 star Fijian Resort. 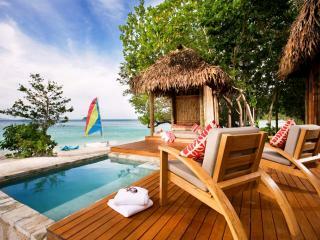 Tadrai Island has only 5 ultra indulgent Villas all absolute beachfront with private plunge pools. You will be amazed by the service, the food, your surroundings and the true romance offered at this Island of paradise.